Well, this was quite the surprise. Had you told me that Sharp and Soulkey would both make the finals two months ago, I would've thought this was a rather bizzare joke. Not to say that neither is talented, but Sharp has always lacked something other than his great TvT, and Soulkey while fantastic overall, kept missing the target for years now. From that perspective, it would be hard to believe that either of them would make it this far. Both players performed exceptionally well in the semifinals. Facing off against Rain, Sharp won the macro game constantly causing Rain to resort to early game proxies or unorthdox timings to take some wins. Despite Rain bringing it back to a decider, Sharp took the final game on Circuit Breaker making his first finals since 2016. Soulkey in his match against Last showed us why he's considered the ZvT specialist as he beat Last 4-0, certainly a blemish on Last's great TvZ winrate, and a bit of an unexpected result. With this win, Soulkey got his revenge, and is now set to stand on the finals stage in several days time. These victories set up a Sharp vs Soulkey finals which is set to start in . Read the preview of the finals by BigFan then the Tour De Sharp, a liquibet-related adventure by Bisudagger. Let's get ready to rumbleeeeeeeeeee! 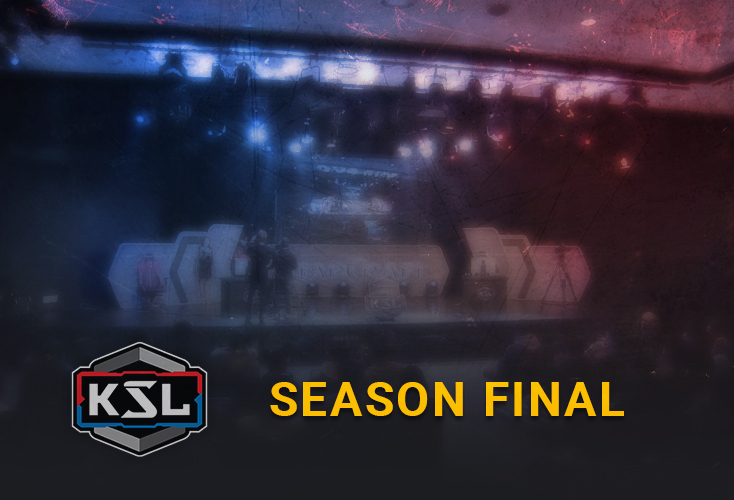 Almost 2 months have elapsed since KSL2 started, and we will shortly be treated to another finals. A TvZ, one of the best matchups that BW has to offer will be played on the grand stage between two unlikely foes! Reaching the quarterfinals in ASL6, he lost to Last who was playing at his peak, but this was the start of something great. Much like a plant stretches itself towards the sun, Sharp began to struggle valiantly, rising above the challenge and pushing himself like never before all in order to secure his first title in ASL's younger competitor, KSL. After losing his first close match to Larva in the Ro16, Sharp kicked things into overdrive, beating both Movie and Jaehoon in strong fashion. He slew Mind in the quarterfinals quite convincingly off the back of his stellar TvT, but perhaps the culmination of his success so far was his battle against Rain. Despite his great form, up against a PvT master such as Rain, Sharp was written off as a free win for Rain. Infact, only a small portion of TL liquibetters believed in Sharp, and who would blame them? I also personally believed that Rain would decimate Sharp, given their histories. Sharp was showing better games, and was recognized for that, but can he really contend with someone of Rain's caliber? Does he have what it takes to take on an ASL champion? Is this finally his time? Alas, Sharp proved us all wrong. If anything, Sharp showed that he can toe to toe, and even beat some of the best at their own game. Despite what the 4-3 score leads you to believe, Sharp had the upper hand, and beat Rain in the majority of their macro games. It was impressive to see Sharp up 3-0 against such a PvT beast. While Rain fought tooth and nail to bring it to a game 7, utilizing every Protoss trick in the book, Sharp won in the macro game yet again, stealing the spotlight for himself and cementing his first finals appearance since 2016! His opponent in the finals? Soulkey, a ZvT specialist who was known for his iron defense! Soulkey had his own path to the finals, but he had to overcome a powerful foe in the semifinals. That foe was Last, a Terran player who knocked out Soulkey 4-2 in their last KSL semifinals encounter. Much like with Rain vs Sharp, many believed that Last will win their series again. Last looked confident, had the history and skills yet we all know what happened that night. Soulkey came into the semifinals bent on getting revenge against Last. To redeem himself, and indeed show that he's one of the best Zergs and one of the best ZvTers in the current scene. And he managed to just do that, no, he managed to go far above and beyond what anyone expected. It was a complete shutout, a 4-0 win against Alphago with Soulkey taking command in most of the games. Unlike Sharp however, Soulkey has always been on the radar of my fans. Since his arrival back in 2016, he took part in many events, and was always considered one of the best, but he'd always flatter at the finish line. His highest ASL finish was a semifinals appearance in ASL3 where he lost a close 2-3 series to Flash on Circuit Breaker. Otherwise, he's made the quarterfinals once in ASL4, a single Ro16 appearance in ASL6 as well as two Ro24 placements in ASL2 and ASL5. For someone considered at the top of the Zerg chain, and was commended by Flash for his ZvT skills, he kept failing to get as far as he wanted, losing to many players such as Flash, Hero, Action or Shuttle. The only exception was during the WEGL Starcraft Remaster Super Fight event in 2017 where he bested Last, Flash and Larva with a flawless 7-0 record to win the finals, but that was a small one-time event that was not as prestigious as either ASL or KSL. So, what was his path to the finals? He ended up having to face and beat Mini twice after getting 0-3'd by Mind in the winners' match in the Ro16. He then beat Larva in a great series before he got his revenge on Last, decimating the Terran one-sidedly in the semifinals. Unlike the last KSL, he had just the right amount of units at the right time which allowed him to comfortably advance to the finals. The pieces all fit in place, with Soulkey finally playing like himself. He always had the skills to compete with the best, yet he could never grasp it, until now that is. This time, there is something different about Soulkey. Much like Sharp, he's going to be fighting at full strength so that he can take the finals and crown himself as the first Zerg KSL champion. Who is more likely to take the finals, Soulkey or Sharp? Both players have shown some impressive series so far. Most notably, the semifinals showed that both players can make the unexpected happen, defying expectations as they desire. For Sharp, his TvT was always his defining feature while his TvP and TvZ felt uninspired and lacking. In tournaments which are brimming with Protoss and Zerg players, he was eliminated early on. However, if this KSL is any indication of his new skill level, he's managed to take a great step forward. His series against Larva was close, a 2-3 defeat however, he showed us some of his best bio control in what feels like ages. He was solid, unrelenting, made the right decisions, and deflected zergling aggression well in their games, such as their game on Into the Eddy. Against Rain, Sharp played with confidence, making decent decisions in most of their games, and taking close engagements that helped him stem the tide of the Protoss. Taking 3 straight macro games with great positional and solid gameplay is difficult against a Protoss such as Rain, but Sharp had no problems doing it over and over again much to our surprise. While his games of the past felt uninspired, it truly feels like Sharp has finally overcome his limits in this KSL, and has decided that now is the time for him to rise again. If there's one thing that Sharp looked weak to, it's early game shenanigans. Proxies or odd timings etc... were something that Sharp lost to in his games against Rain, and there's a chance that a Zerg of Soulkey's caliber can easily exploit that weakness in Sharp's game. That and Sharp seems to put himself in a worse position through a fault of his own at times so that's something that he needs to work on. Ironically, it seems that Soulkey has much of the same problem. Now, it's true that Soulkey showed some great early game defenses against Last when he deflected Last's bunker rush in game 3 with ease, or when he easily took care of his bunker in game 4 on In the Way of an Eddy, but his games against Mind showed that those kinds of early game strategies can work against Soulkey quite effectively. Otherwise, how can one explain such a shutout by Mind? Soulkey has shown us his great late game balancing act in the past as he's beaten Terrans that were stronger than Sharp in TvZ so he's definitely going into the finals with an advantage regardless. However, he should be careful not to become too complacent. Sharp is hungry for the win, and his celebrations show that for Sharp, this is an emotional moment, one that he wants to etch in his mind for years to come. Watching Sharp, you can't help, but want to root for him as he's certainly considered the underdog going into the finals, however, if Sharp wants to win, he has to be willing to throw down proxy rax, and use unorthodox strategies to get Soulkey off his game. If he is unable to knock down Soulkey a peg or two, with Soulkey making it to the late game unscathed, he's going to contend with the full power of the Zerg arsenal. Caught in the middle of a celebration! As it stands, Soulkey has the advantage in their head-to-head engagements, having won 4 out of the past 5 games. He was also the Zerg who knocked out Sharp in the last KSL in the quarterfinals with Sharp only managing to grab a single win on Roadkill. While the two avoided playing sponmatches against each other this month, Sharp's TvZ winrate sits at 64.5% from a sample size of 62 games while Soulkey's ZvT winrate sits at 76.9% from a sample size of 13 games. Of note is the fact that neither player has a losing record against their opposition, but Sharp's Zerg opponents were mostly of a lower caliber compared to Soulkey's Terran opponents. This finals will come down to a lot of preparation, and who is hungrier for the win. While Soulkey has the advantage, it's not a shoe-in by any stretch of the imagination. If Sharp prepares well, and plays his cards right, there is definitely a chance he can upset Soulkey by exploiting his weaknesses. However, if Soulkey is able to shore up his defenses, and make it to the late game, his chances of winning this series will go up even higher! Expect lots of fireworks as both players are motivated to take their first championship! Soulkey to take the win and championship, 4-2! 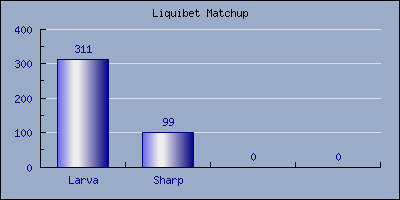 Sharp entered this tournament with low expectations from liquibet voters. Let’s travel down the ethereal bike path that Sharp has created and see if he has won the hearts and minds of Brood War fans everywhere! Sharp’s opening match featured Larva as his opponent. Larva has not been active in premier tournaments lately, yet his star power and online results still greatly win over voters who remember what Larva is truly capable of. In this instance, the voters were right on. 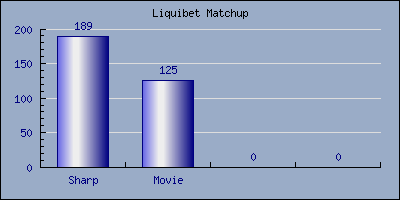 Sharp’s 3-2 loss in the first series was not enough to make voters confident in his next match against Movie. Despite Movie’s poor form over the past 2 years, he still manages to get 40% of the vote. This close series and 3-2 victory was enough to give voters another point, but reinforce the tough decision this vote was. Sharp finds himself one win away from advancing to the round of 8. Jaehoon, the slightly improved version of Movie, takes his stand. Voters see this series as a repeat of the last one and vote closely again. With Jaehoon taking an increased percentage of 44%, it is clear that Sharp has not convinced enough people that he is the real deal. Still, he advances and voters win once again. 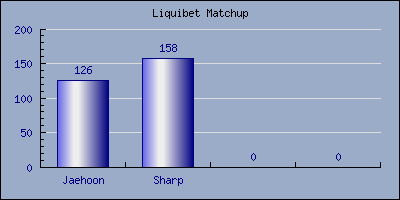 Liquibetters find themselves on a 3 vote streak and correctly predict the strength of Sharp thus far in this tournament. Entering the round of 8, Sharp is presented with Mind. On paper, Mind should be destroyed given his terrible TvT record of 3-9 between KSLs and ASLs, and 11% TvT winrate in tournaments since October 2017. But alas, he won an MSL against mutha effen Bisu, so he must be good, right? For Liquibetter or worse, voters steer towards Mind and find their hearts crushed! As we near the end of this race, a seemingly easy and “in the bag” vote must be cast. Rain, who recently crushed Last, must take the fight to Sharp. 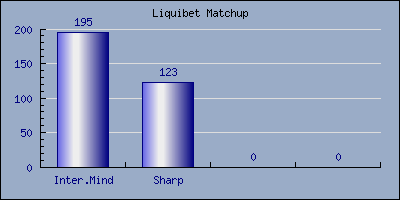 Sharp’s tournament run has been against mostly weak opponents and other then blind fandom or risky liquibetters, the consensus is that Rain will most definitely win. Votes were locked in at a score of 282 to 27 (a paltry 8%) and once again, Liquibetters find themselves crushed! We are in the final leg now with Sharp versus Soulkey coming up. Without knowing the vote count ahead of time, we can only speculate how the liquibet community will vote. Soulkey is a ZvT specialist and on paper is a clear favorite. Sharp is definitely the player who has captured the hearts of many, and proved he is ready to take it on the main stage. Now the time has come, will you, oh valiant liquibetter, choose the safe choice or be so bold as to pick the underdog that is Sharp? I find it odd that you think that Sharp should play cheesy and very unorthodox against Soulkey. Didn't Last show us that doing that is very dangerous? In my opinion, Soulkey showed us that the rough series against Mind is (at least for now) in the rear view mirror. I think you undersell that angle. I don't think that Sharp has much chance in this series, anyway. But who knows, maybe I'm just still disappointed that we didn't get a Rain vs Soulkey final. I think you misunderstood. I think Sharp should go for macro games, however, he should also not be afraid to try proxies or any strategies that can damage Soulkey's economy early on. Let's face it, if Soulkey gets into the late game unscathed, Sharp is going to have it rough, however, from his series vs Larva and Rain, I do believe that he's got the skills to potentially take this series if everything falls into place. Hopefully Sharp proves me wrong, but Soulkey definitely has the advantage regardless of how bad his series vs Mind was (Mind is a superior vZ player imo, even if his result don't fully line-up). Gotcha, that makes more sense. It really will depend on whether Sharp proves that he is much more than what we have thought he is - just like Last did in KSL1. By the way is this your final article then? I liked it, you built up both players while still having a realistic prediction. I also liked the graphs at the end. Thanks for supporting brood war. Ya, I don't think he should go all out with odd strategies, but if he can mix them in, and realize that he's taking a risk, but the payoff is worth it, he can potentially take this to a game 7 or win earlier. It honestly depends on which version of Sharp and Soulkey show up that day, but there's no doubt that both of them want this really badly, especially Sharp. Edit: Bisudagger actually wrote that section, if you are referring to the LB bits. I read the article but found nothing underlined and emphasised in the body of the article. Anyway, this will be an interesting match! Sharp has shown that he was willing to open factory starport vs Rain and go wraiths vs carriers, I wonder what he has in store for Soulkey. I voted with my heart and picked Sharp. Who else has the guts? I think Sharp is gonna take it. He seems to be in a very good state of mind recently. It wasn't that he was dominating but rather he had plans and didn't tilt playing the previous games. Soulkey can still surprise us tho. I voted with my brain and picked Sharp. honestly im confused with the comments,you guys overhype soulkey since his return then he finally reach the final and u guys rooting for Sharp ? oh well if Sharp has a good day he can win the best zerg players,he tends to be weak vs agressive zergs and soulkey tends to go into that direction very often so we will see.i dont expect a close final. Guys what’s the difference between the styles of Soulkey, Larva and Effort? I’m trying to read up to get hyped. Hope that Korean guy answers me that is like an enclyopedia. Soulkey's muta timings and micro are some of the best: although not as frantic and aggressive as Effort or JD, he's up there when it comes to being effective with it. He mixes hydra's pretty well in his strats. I guess he's a very complete Zerg, whereas Larva is a macro zerg with Effort being really good at timing attacks and agro-style. At least that's how I see them. However, if Soulkey is able to shower up his defenses, and make it to the late game, his chances of winning this series will go up even higher! Seems like a pretty decent summary of their strengths imo. Great writing style BigFan. Slightly airy light tone that went along with all the need to know details. Similarly I enjoyed the write up as always. Thanks guys. I'm glad the finals were a blast, and a good watch as well. Are there replays of these matches somewhere? aka KanBan85. Working on Starbow. Doubt there'll be replays available, there never is for BW tourneys. Having said that, the players themselves probably still do have them, and if you can get in touch with them, you can get the replays, but they'll charge you typically. Or did you mean vods? I meant replays, but that's ok. I was looking for how Soulkey did his two hatch muta vs terran BO, but I'm sure I can just follow the luiqipedia guide and it will be quite similar.